Teaching relaxation and mindfulness skills can be extremely helpful for our clients. The ability to calm and focus our minds, even when we cannot change the situation around us, is an important part of distress tolerance, overcoming anxiety, and healing from trauma. 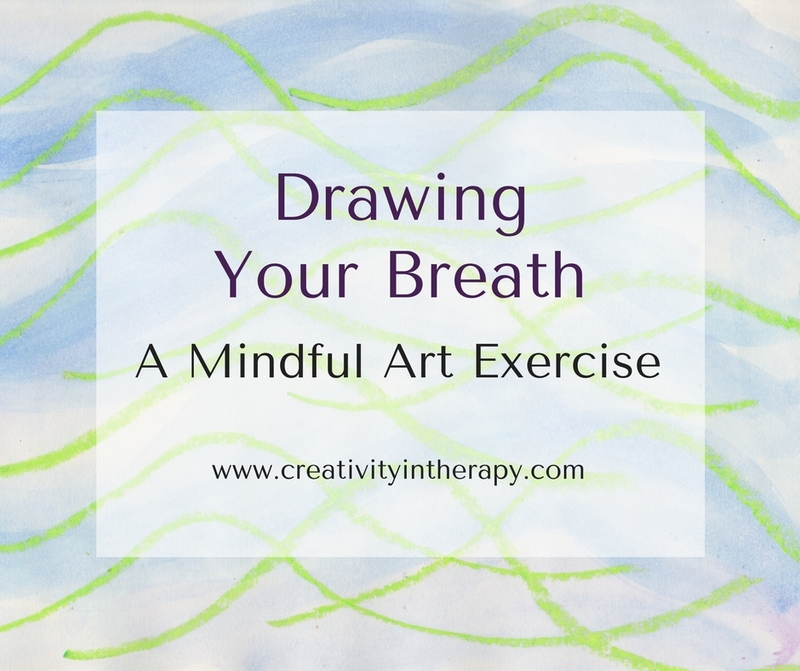 Drawing the breath can be a wonderful exercise for practicing mindfulness through awareness and focus on the breath. 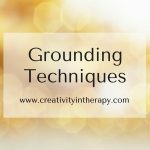 This is an exercise that I actually first heard about from a client who had done it at a mediation retreat. I then came across the directive in the book Managing Traumatic Stress Through Art: Drawing From the Center. 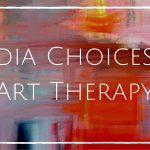 As I practiced this art exercise for myself and with my clients, I discovered that there is a lot of value in this simple activity. It is something that can be done often for continued practice, does not take many art materials, and does not have to take much time. 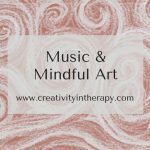 It helps to build awareness and focus as a meditation or mindfulness tool, or can be part of a relaxing art process. And it does not take any artistic ability. Clients can appreciate the experiential nature of the exercise without worrying about the end result of their drawing. 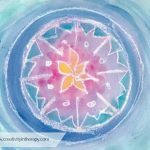 If you have already downloaded a copy of my free ebook Creative Renewal for Healers, you have seen this exercise in the book. If not, I encourage you to give the directive a try for yourself and with clients and invite you to download a copy of the ebook here. Place your pencil or chosen drawing medium on the paper. Take a moment to notice and observe your breathing. Visualize your breath as a line and represent this on the paper. Spend a few minutes playing with different types of lines as you notice your breath. Try altering your breathing a bit faster or a bit slower and then notice how this changes your lines on the page. Try changing the quality of your lines and notice how you could change your breath to match. Get a new sheet of paper and now focus on deep, slow breathing for relaxation. 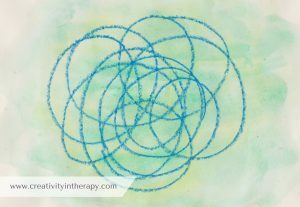 Again, draw lines that represent your calming breaths. 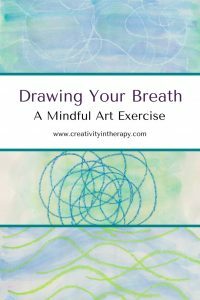 I like to pause as I inhale and then draw the exhale, leaving my pencil on the page to create a continuous line; others may want to create a new line for each breath. Continue for a few minutes to let yourself relax into the calming sensations of breath, motion, and lines. 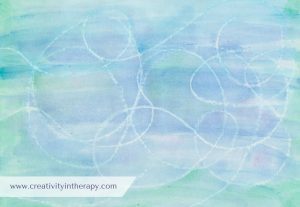 You can use any drawing medium – pencils, markers, oil pastel, or chalks – and any size paper, but I prefer a large sheet of paper to encourage space for deep breaths. 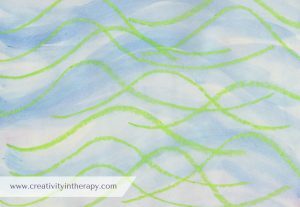 Although the original directive suggests using drawing media that you can easily see, you could also do a variation with white oil pastels on white paper, adding watercolor later for a resist painting. Remember that there is really no right or wrong way to do this type of art, just encourage the client to focus on what feels right for them. 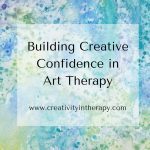 Talk with clients about their experience with the art and paying attention to their breath. What is the natural quality of their breathing – shallow or deep, fast or slow, even or irregular? How did the lines and breath change as they shift from simply noticing to consciously taking deep breaths? Do they want to further develop one of their breath drawings into another image? I always love to hear your thoughts! Comment below if you have used this exercise for yourself or with clients. What a fantastic way and technique… I will definitely try this out. Really interesting and relaxing! Thanl you very much. It is wonderfull to feel relax during this excersise. Is there a video that I can view to see this technique. I work with little ones and would like to incorporate it into my treatment plan. Hi, I don’t have a video right now. I’ll see if I can shoot something quick to post soon. I would recommend that you just give it a try and see what feels right for you, then you could demonstrate for the little ones. The essential idea is that each line or motion of the hand represents a breath. I use breath with my clients to activate the vagal response when amygdala has been set off. This is a wonderful exercise! Going to try it on myself first! Glad it seems helpful for your clients! 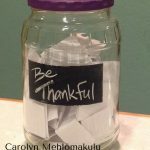 Going to try this with a family, thank you for awesome idea!